A vaccination or immunization is used to help the body protect itself against specific types of viruses or bacteria. Typically, a vaccine is administered as an injection in the upper portion of the arm. Medical experts with the American Academy of Pediatrics recommend that children receive 11 different vaccines before the age of 6. A parent or caregiver should discuss the most common side effects of vaccinations with a doctor before having her child immunized. One of the most common side effects of a vaccination is an injection site reaction. 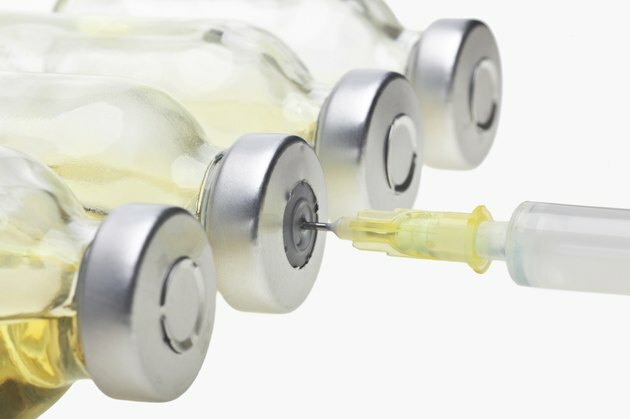 Treated patients can experience pain, swelling or inflammation at the site of injection, warn health professionals with the Centers for Disease Control and Prevention (CDC). The skin surrounding the injection site may appear red or bruised and can be tender, sore or warm to the touch. Certain patients can also develop sensations of itching at the injection site. These side effects of vaccinations are typically mild and will subside within a few days following vaccination. Patients who experience severe or persistent injection site reactions should seek medical care as soon as possible. Patients can develop flu-like symptoms within a few hours or days following a vaccination. These flu-like symptoms can include fever, fatigue, body or muscle aches, headache or nasal congestion, reports KidsHealth, a children's health information website supported by the Nemours Foundation. Fever symptoms can be accompanied by sweating or chills. Additionally, infants and children may appear unusually fussy or irritable after receiving an immunization. Flu-like symptoms are temporary and typically resolve within a few days of treatment. Patients who develop high fever symptoms or persistent flu-like symptoms following a vaccination should be seen by a physician as soon as possible. After receiving a vaccination, certain patients can develop upset stomach symptoms. These side effects most commonly occur following treatment with an oral vaccine, rather than an injectable vaccine. Upset stomach symptoms can include nausea, vomiting, stomach pain or diarrhea, explain CDC medical experts. Patients who develop an upset stomach can also experience a temporary loss of appetite. These common side effects of vaccinations will resolve shortly after treatment. Patients who experience severe stomach upset after being immunized should seek prompt medical care.